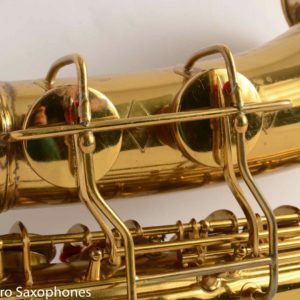 Highly Collectible Oscar Adler Markneukirchen-made curved soprano saxophone. This instrument has three ‘petal’ keys that allow you to play low C#, B and Bb with your right hand fingertips, which is pretty useful actually. I have never seen another instrument like this one in person or online. Excellent condition. I had two of the petal key touches expertly (and invisibly) restored where they had been shortened. Comes in a cool possibly-original red case with tons of storage. Pads are older of course, but it will play a bit on them, with a big, wide, dark spread tone. 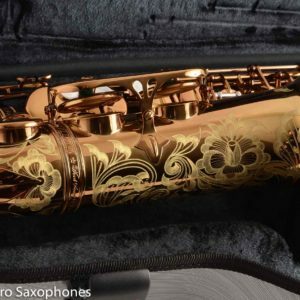 Super cool piece of saxophone history here. 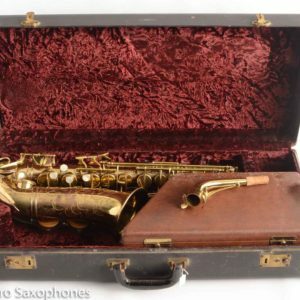 This instrument may be from around 1909 or so, though I am admittedly not an expert on dating early Oscar Adler saxophones.